1. Developing an idea isn’t a linear process. As you work your way through you’ll inevitably need to revisit earlier steps, question assumptions, rethink choices. You’ll do better at holding onto your sanity if you can think of this not as “time wasted going down the wrong path” and instead remember it’s all part of the process. 2. There isn’t one “right” way to develop, outline, or write a screenplay. What I’ll cover in this five-part series is simply one way to do it. 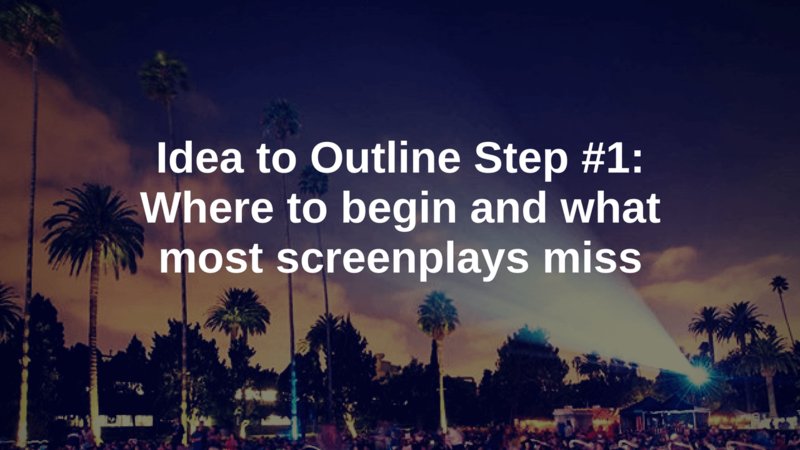 It’s a process that attempts to address some of the most common issues in early drafts of screenplays. Things we get blind to when we’re immersed in our stories, and that readers end up commenting on quite often. 3. You should take everything I say as a suggestion, an option to consider, not a rule. Every writer works differently, and I 100% believe you should do what works best for you. So you want to write a screenplay. Where do you begin? Everything you know about the idea so far. What excites you about this project. Your vision for the finished movie. What does it look like? How does it make you feel? What does it remind you of? You may feel like you know very little so far and that’s perfectly okay. When you’ve written everything that initially comes to mind, you can use the old standby “who wants what” questions as a jumping-off point to continue brainstorming. You don’t have to make any decisions about these story elements yet. Simply start thinking of the possibilities. Anything at all that comes to mind when you think of your idea is fair game. Throw it all into one document, in any order it comes. It’s exciting to let your imagination go and just type (or hand-write) with abandon and that’s the aim here – to explore, and to let all the little bits and pieces that interest you collect in one spot. Since there’s no other purpose for this document, there’s no pressure to make it “good.” The best version of this document is the one that contains as much about your idea as you can think of. There’s one last thing I recommend thinking about in this free-writing phase, and it’s something that’s often missing in finished screenplays. That’s why I suggest starting to explore it now – but that’s the part I want to emphasize: the spirit of exploration. There’s no pressure to nail it down right now and, to be honest, you probably won’t. But if you can at least figure out what neighborhood you want to wander around in, that’s a great place to be at this point. So what is this final thing? To my mind, all of these things are in the same orbit, so for our purposes think of it in whatever way rings true. What we’re trying to get at is really the big idea at the heart of the story that makes it interesting and meaningful to you. You’ll be able to use this as the organizing principle for your story. Identifying it – especially early in the process – can give you a touchstone to refer back to, to help you stay in touch with what connects you to the story. I know this sounds squishy. It might be as tough to articulate as it is to grasp, which is why everyone seems to have a different way of expressing it. But it’s worth thinking about because when a script is lacking this “what’s it about” type of idea, it’s noticeable. A screenplay might still be good without it, but it won’t be great. It won’t quite resonate. Gee, thanks, you’re saying, what am I supposed to do with that? That’s right – I dropped an advanced-level screenwriting concept into your lap on Day 1. Again, you don’t have to nail this down today. Just begin to explore. Find a neighborhood you like. You may have noticed that these statements are all sort of theme-adjacent yet I’ve avoided mentioning the word “theme” up to now. That’s because 1) writers tend to get intimidated by the idea of theme, and 2) we’re not exactly talking about theme here. Theme is still in the right orbit, so if it helps you to think of it that way then please – go forward thematically. But if you, like so many other writers, feel like capital-T Theme is too much pressure, then instead go in the direction of what connects you to the story. What about it pokes at your heart or your gut. What you come up with for your story’s “what’s it about” could be personal, philosophical, or observational. Again, we’re looking for the “big idea” that gives the story meaning for you. And, once again — you don’t have to nail it down in this step – just start locating the neighborhood that feels right. Okay, so your first action step is to find some time to free-write and put all your thoughts about this screenplay idea down on paper, in one place. Have fun. Enjoy the freedom. Next time, we begin to shape.